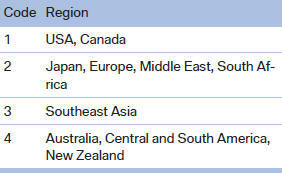 Only DVDs with the code of the home region can be played back; also refer to the information on the DVD. The video image is displayed on the front Control Display up to a speed of approx. 2 mph/3 km/ h; in some countries, it is only displayed if the parking brake is set or if the automatic transmission is in position P.
3. Select a DVD with video content. 3. Select a CD with video content. 5. Select the desired track. To open the video menu: turn the controller during playback. Press the controller when "Back" is displayed. In fast forward/reverse: the speed increases every time the controller is pressed. To stop, start playback. 1. If necessary, turn the controller to open the video menu. The DVD menu is displayed. The display depends on the contents of the DVD. 3. To select menu items: move the controller and press it. To change to the video menu: turn the controller and press it. 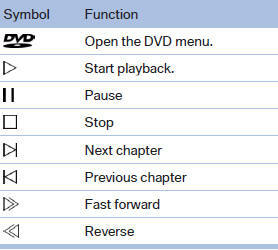 For some DVDs, settings can only be made via the DVD menu; refer also to the information on the DVD. 1. Turn the controller during playback. The subtitles that are available depend on the DVD. 4. Select the desired language or "Do not display subtitles". 4. "Brightness", "Contrast" or "Color"
5. Turn the controller until the desired setting is reached and press the controller. Display the video image on the entire screen. 1. Turn the controller when the DVD menu is displayed. 2. Select the desired track. The availability of a different camera angle depends on the DVD and the current DVD track. 5. Select the desired camera angle. These functions are not contained on every DVD. Therefore, they may not be available for use.